The pace of change in our world is much more rapid than it was a decade ago, and with the influence of technology and the human thirst for knowledge and the new, this pace is not likely to slow. An organization’s ability to recognize this and stay abreast of the change curve is a highly evolved skill, one that often means the difference between average performance and brilliance. RRC works with organizations to develop this capability through the use of the RRC Strategic Planning Model. The RRC Model has been developed over 20 years of working with a wide range of leadership teams, and has proven time and again to be simple, intuitive and to make sense. Strategic planning has become, for many, a lackluster, go-through-the-motions exercise, so much so that many leadership teams have given up the practice. The RRC model is effective because it reclaims what the strategic planning exercise was supposed to be about: inspired visionary leadership. Strategic leadership is based on the conversation among leaders that results in shared answers to a set of strategic questions. These questions drive meaningful discussion and result in answers that provide a framework for understanding, for decision-making and for addressing ongoing change. The RRC model focuses on the leadership questions that deeply engage people and when answered, create a clear pathway for action. The RRC Strategic Planning model is based on common strategic planning concepts such as vision and mission, but amplifies these through the strategic questions that underlie each. A vision statement can be far more compelling and inspiring if leadership understands the question their vision statement is designed to answer. In fact, each part of the strategic plan – vision, mission, focus area, goal – represents an answer to a distinct and important leadership question. The parts of the strategic plan and their underlying questions are provided in the RRC Strategic Planning Diagram. The RRC model also describes the relationship between the different parts of a strategic plan. For example, the vision and mission statements answer different questions, but they work together to provide a conceptual frame for the work of the planning entity. Therefore, it is both the answers and their relationship to each other that make a strategic plan meaningful. These relationships are also depicted in the RRC Strategic Planning Diagram. Another concept of the RRC model is the importance of alignment among and between different leadership levels within the same organization. In the RRC model, the set of leadership questions and resulting answers depicted in the diagram can be addressed by any level or in any part of the organization. The concept of tiered plans based on a common conceptual model enables large organizations to synchronize between leadership levels and functional areas. The utility of the leadership conversation is applicable to all levels of leadership. All leadership bodies, whether at the national, regional, or local level, benefit through the development of a common strategic leadership frame from which to make decisions and take action. Therefore, the linkage and alignment between these leadership frames is an important consideration. The concept of accountability is also important in the RRC model. Accountability in relation to planning means that leadership establishes desired outcomes and then monitors progress toward them. Progress toward outcomes is best indicated by a neutral measurement: something representative of the outcome that can be counted, in a specific time frame. A common pitfall in formulating progress indicators is measuring the output of the work activity used to move toward the outcome, rather than measuring the progress toward the outcome. This is akin to the difference between a global positioning device and an automobile odometer: one shows exact location, a direct indication of proximity to a destination, while the other indicates tire revolutions translated into miles, not a measure of being any closer to a destination. For this reason, the RRC model focuses leadership attention on formulating measures that will show progress toward the outcome. ​The RRC model results in a total strategic frame for an organization by engaging leadership in the broadest philosophic questions, through its primary goals and strategic action, to resource review and allocation. The model also takes into account the overall, changing environment in which the group is working, as well as the beliefs and values that the organization holds as essential. The model provides a method with which a group is able to refine its thinking and then extrapolate this clarity to its future. The World represents those global forces that affect the ability of the organization to carry out its mission. Beliefs/Values express the unique character of an organization and provide a foundation for all plans and activity. Focus Areas provide structure to the organization’s mission work, which is further described by goals and objectives. Focus Area structure is based on an organizing principle. Leadership is empowered by examining the existing organizing principle, and considering possible alternatives. Program of Work provides the specific activities necessary to accomplish the goals and objectives. Capacity Areas represent the resources required for the mission to be delivered. Key areas of capacity are People, Money, Knowledge, Infrastructure, Technology, Image, and Governance. There are goals and objectives relating to capacity that, with the mission focus areas, provide the total set of outcomes an organization chooses to work toward. Outcome Measures provide a neutral indication of whether progress is being made toward the desired outcomes. One of the challenges to strategic planning is the language used for the concepts that make up the planning discussion. Planning language is often not commonly understood by those using it and therefore conversation can become unclear. For this reason, RRC provides a diagram that acts both as a visual map of the planning territory and also as a conversation guide. If two people are conversing, and one is talking at the vision level while another is responding at the program of work level, this can appear to be a disconnect or even conflict. The RRC diagram enables groups to daylight what part of the plan is being discussed and to understand the relationship between all of the parts. In the diagram, the vision is shown in the clouds to represent its inspirational and future oriented qualities. 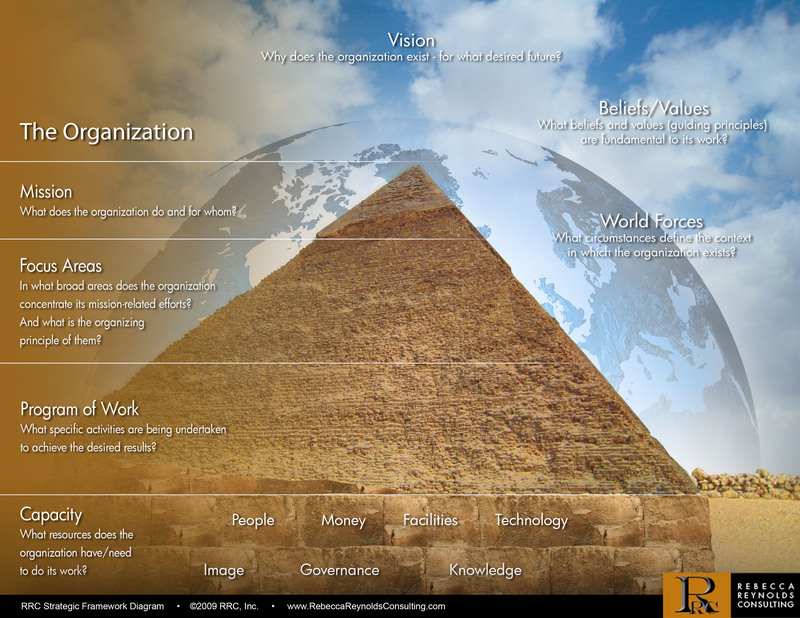 The entity that is conducting the planning (the organization) is represented by the pyramid, which is surrounded by the world, indicating the dynamic set of forces having an impact on the organization. The organization’s beliefs and values sit outside the world since they exist independently of changes in the environment. The pyramid’s point is the mission statement. Like the point on an arrow, the mission statement expresses in clear, simple language what the organization does to work toward the realization of the vision. The organization’s work to achieve its mission is represented by the pyramid that widens from its point, just as the work becomes more varied and specific under the mission. The pyramid rests on its foundation. The foundation represents the organization’s capability to actualize its mission and mission-related (i.e., customer focused) work. The foundation is underground to show that this part of the strategic plan is about the needs of the organization, as opposed to the work it does to serve its customers. Customers care about the mission work, but have little interest in the organization’s capacity needs. However, capacity needs are vitally important to the health and longevity of the organization at large, and it is leadership’s responsibility to maintain the appropriate balance between capacity and mission work to provide for institutional stability. "The guidance, coaching, planning and strategic thinking provided by RRC has helped us achieve small and large successes in our everyday work, as well as in our long-term project, program and agency goals."